1822 was when this small scrub was discovered by a Baja, California botanist. He named this scrub after his best friend T.W. Simmonds, making the proper name for the Jojoba plant, Simmondsia chinensis. 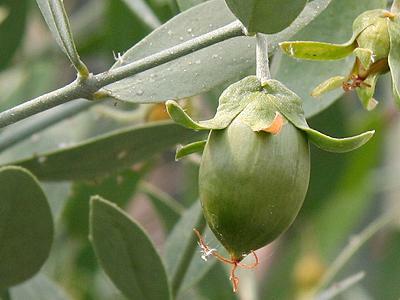 The Jojoba plant produces a small bean pod. It was discovered when heating the beans from the bean pods, a botanical extract was secreted, thus creating the Jojoba (pronounced ho-Ho-ba) oil we know and use today. Jojoba is actually not an oil, but rather what is called a wax ester. Remembering the days of Chemistry class, (I am so glad my Chemistry professor was a close friend) an ester is an organic, often fragrant compound formed in a reaction between an acid and an alcohol with the elimination of water. I know, too much information, but why do we care—because out of all the compounds in nature, this wax ester is the most similar to human skin oil (sebum). Theorist say applying Jojoba oil to the skin can “trick” the skin into thinking it is producing enough oil, thus balancing oil production, making the skin not too oily—not too dry—just right! Want your skin to feel just right? Apply Eight Body Moisture at least twice a day.